Fast moving and hard hitting, this .45 ACP +P ammunition offers dependable performance in a self-defense situation for those trained to manage its recoil. 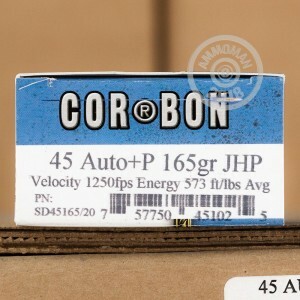 Manufactured by Corbon, these rounds come in boxes of 20 and fire a light 165 grain jacketed hollow point bullet at a muzzle velocity of 1,250 feet per second. This results in very strong expansion and just the right amount of penetration for maximum effect against an assailant. 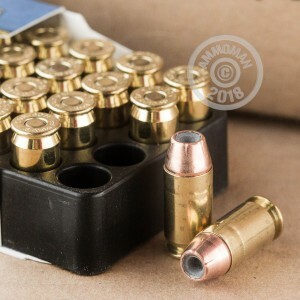 These cartridges are loaded in Sturgis, South Dakota and use reloadable brass cases and non-corrosive Boxer primers. 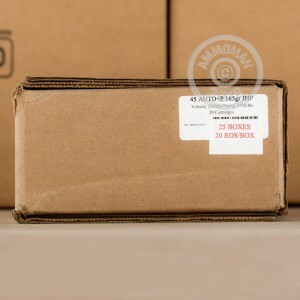 Buy a few of these boxes or purchase any combination of items totaling $99 or more to get free shipping from AmmoMan.com!